Inspired by A Christmas Carol by Charles Dickens, Marley & Scrooge unfolds through the eyes of Scrooge's former, and quite dead, business partner Jacob Marley. 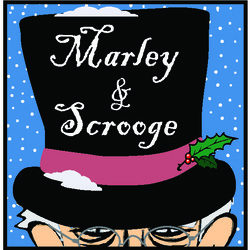 Marley follows Scrooge around making observations, rattling chains, and tossing out clever witticisms. Through song, dance and narration, the memorable Dickens story is retold. All the well-known characters are here: miserly Scrooge; his steadfast employee Bob Cratchit and his damaged, but saintly, son Tiny Tim; Spirits of Christmases Past and Present, who lead Scrooge on late-night journeys to relive long forgotten memories; and the ominous ghost of Christmas Future, who shows Scrooge one possible outcome that awaits him if he doesn't change his contemptible ways. This delightful holiday classic, which was developed, written, and composed at Cottage Theatre a number of years ago, enjoyed a sold-out world premiere in 2004. This year's newly-revised Marley & Scrooge is sure to please your entire family.